Bite into a chili pepper and your tongue feels heat, even though the actual temperature in your mouth doesn’t change. A similar trick occurs with mint. Mint is an herb with a cool character, popular in both food and medicine around the globe. Its coolness comes from a volatile oil called menthol. This waxy, crystalline chemical stimulates the same receptors in our cells that experience cold. Menthol is why cough drops, toothpaste, and mint gum give your mouth that icy feel. There are hundreds of mint varieties available. In a pinch, most mints can be used interchangeably, but there are some important differences to consider. 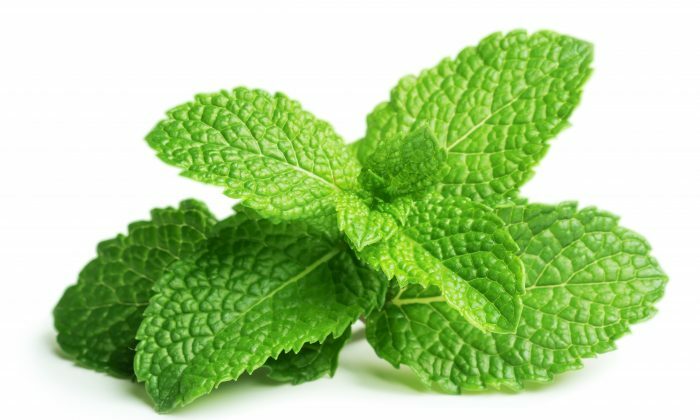 In general, menthol-rich mints, like corn mint, are preferred for medicine, while sweeter, mellower mints with minimal menthol content, like spearmint, are the predominant choice for food and drink. Peppermint is a hybrid which has more menthol than spearmint but less than corn mint, so it is used in both food and medicine. However, babies and other sensitive folks may still find the icy bite of peppermint mint too strong, and reach instead for spearmint as their remedy of choice. 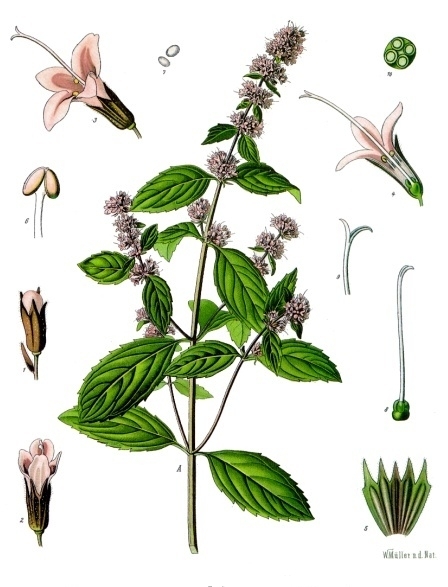 Spearmint illustration by Franz Eugen Köhler, 1887 (Public Domain). Mint has many medicinal uses, but it is probably best known for treating a wide range digestive problems. Gas, heartburn, nausea, morning sickness, stomach cramps, and bad breath all benefit from a bit of mint. In his book ‘The Green Pharmacy,’ herbalist and former botanist with the USDA’s Agricultural Research Service, Dr. James A. Duke celebrates mint’s digestive virtues, even if U.S. regulators can’t see its value. This discrepancy is because some studies don’t support mint’s ability to relieve digestive complaints, although most do. In addition, mint’s stomach soothing reputation has endured for thousands of years. The world’s oldest surviving medical texts mention mint for indigestion. Commission E—Germany’s agency for evaluating herbal remedies—still recommends it. Sometimes a strong mint is so cold it’s hot. Peppermint in particular gets its name from its icy-spicy quality. This means that it not only has a numbing effect, but it also increases circulation. This makes mint an excellent herb for pain. A German study from 1996 found that diluted peppermint oil rubbed on the forehead was as effective for headache pain as 1,000 milligrams of acetaminophen (Tylenol). When you come down with an infection, reach for mint. It not only helps with a stomach flu, but it can also treat symptoms of respiratory infections too. Menthol’s cooling vapors relieve aches and pains, opens pores to reduce a fever, and gives temporary relief from sinus congestion and cough. Mint can also help protect you from illness. It has antibacterial and antiviral properties, and is high in vitamin C to support the immune system. Menthol is a common chemical in modern dentistry not only because of its great taste but also because it reliably reduces infections, even antibiotic resistant ones. Eat it. In the heat of the summer, mint is so abundant that it begs to be used everyday. Add fresh leaves to chopped parsley for a cooling tabbouleh. Mint works well in other summer salads too. Combine spearmint leaves with cubed watermelon and lime juice for a treat to beat the heat. Try tea. For digestive upset, go for the tried and true peppermint tea. Dried mint is easier to use than fresh, because you don’t need as much to make a strong brew. However, make sure your mint has a strong smell. A stale mint tea bag may still darken hot water, but if the smell is gone it no longer contains any menthol and, therefore, no medicinal benefits. To brew mint tea, bring water to a boil and turn off the heat. Add your leaves and cover for at least 20 minutes. This will prevent the medicinal essential oils from evaporating. Enjoy hot or cold. Muscle rub. Because of its pain relieving qualities, menthol is often added to commercial salves and muscle rubs. If you decide to use pure peppermint oil, make sure to blend it with a carrier oil (almond, coconut, or olive) to avoid a skin reaction. Capsules for IBS. Try enteric coated peppermint oils capsules for irritable bowel symptoms. Mint teas and tinctures lose their punch by the time they leave the stomach. The enteric coating ensures that the essential oils make it to the large intestine intact. Don’t take mint essential oils internally without an enteric coating because it can burn the mouth and esophagus. Grows like gang-busters. Like many other medicinal herbs, mint is a prolific plant that can easily turn into a pesky weed. To avoid a mint takeover in your garden, keep plants in a container. Water lover. Don’t let your mint get too dry. These plants are fond of water, that’s why they are often found growing wild near a river or lake. Easy to spot. The familiar smell and leaf pattern make mint an easy plant to identify. Another feature you’ll find among all mint varieties is a square stem. One different type. Corsican mint, a variety native to Italy, looks different than most mints. Instead of tall stems, Corsican mint is more like a ground cover. It has tiny leaves that form a dense, minty carpet. 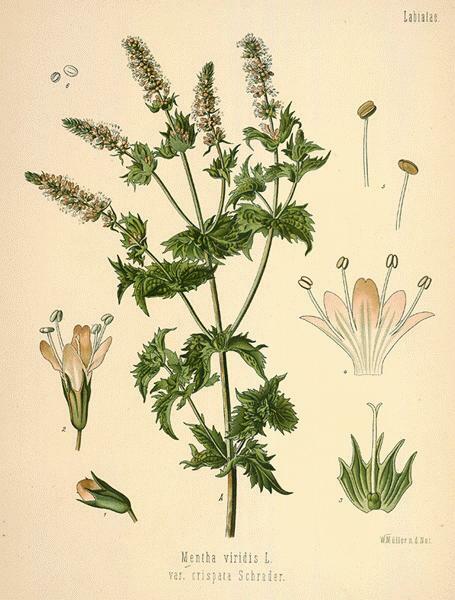 This fragrant, menthol-rich plant is used to flavor the mint liquor, Crème de Menthe. Pest control. Humans generally like the smell of mint, but critters (insects, mice and rats) do not. Mint drives away pests, so some gardeners keep their mint containers near vegetable crops that are often eaten by bugs. Greek nymph name. 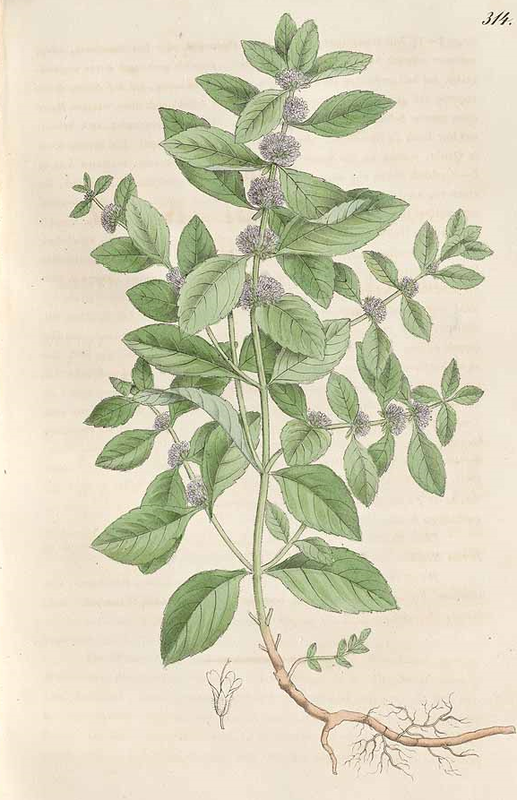 The English word for mint comes from a character in ancient Greek mythology named Minthe. According to legend, Minthe was a beautiful water nymph who caught the eye of Hades, king of the Underworld. This attraction sent Hades’ wife Persephone into a jealous rage. She turned Minthe into a dull, spindly plant—one that people wouldn’t think twice about stepping on. Still smitten, Hades gave the plant its signature mint scent.